Just Another Snake Cult » DIY Fermentation – Kombucha Made Easy! DIY Fermentation – Kombucha Made Easy! I was introduced to Kombucha quite a few years ago by my friend Eva, with the disclaimer that I had to try this drink but some people think it tastes disgusting. It was the weirdest thing I’d ever drank—somewhere between an effervescent apple cider and what I imagine beer tastes like—and I absolutely loved it. (Note, this was before GT’s operation exploded and all the batches started to taste like vineagar.) It wasn’t long before I figured out how to brew my own at home. I think I saw this guy at Whole Foods. What is Kombucha? It’s a fermented tea drink. The fermentation is carried out by a symbiotic culture of bacteria and yeasts, which form a jellyfish-looking pancake (the mother) that is sometimes incorrectly referred to as a mushroom. Though it’s a fermented drink, it has the negligible alcoholic potency of orange juice. It has been hyped as a thousand-year-old, cure-all, Eastern wonder drink, adopted by yuppies as a drink of choice (second to Vitamin Water, of course), but apparently written history of Kombucha only dates back a couple hundred years. It generally sells for $2.50 – $4.00 a bottle (~2.5 cups) at your local and chain health-food stores. Ah, the comodification of wellness. Why drink Kombucha? Kombucha is alive! As with many other “pro-biotic,” unpasteurized fermented foods, the bacteria in Kombucha continue to live in your gut once ingested, aiding in digestion and keeping harmful bacteria and yeasts in check! Though Kombucha is acidic, it alkalizes your body, which is purportedly good against stiff or painful joints, blurred vision, bad skin, and other ailments. Other benefits are associated with the organic acids, vitamins, minerals, anti-oxidants, and live enzymes present. Anti-oxidants fight off “free radicals” in our blood, combating cancer and heart disease. Top that off with some anti-biotic and anti-viral qualities, and that covers most of the health claims. On top of that, it simply makes you feel good and healthy with the energy of a well-functioning body (as opposed that of a flood of simple sugars). Why brew your own? I think whenever possible it is preferable to produce your own foods. 1) It reduces exploitation of resources involved in production, transportation, storage, and retail; 2) it reduces dependence; 3) it’s fun; 4) you have more control over how you want it to taste; and 5) it’s comparitively way cheap. Any of these on its own is reason enough. How do I make it? There are plenty of recipes online for brewing Kombucha, but what they depend on is a “mother”—a starter culture that you can order for like $30. What I figured out is that you can grow your own mother from the live cultures present in a store-bought bottle of Kombucha. 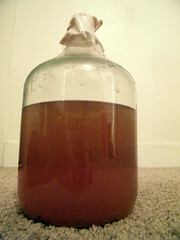 A bottle of store-bought Kombucha. Preferably “original”/unflavored. A cloth that will securely cover the opening to the jar or jug, blocking bugs and mold spores but letting air through. Glass containers to “bottle” the kombucha in. Must have lids. Please note that it is advised to cleanly in this process — chemicals and pathogens can throw off the balance of the culture. Wash your hands. Don’t touch any surface you don’t need to. Soap residues are also bad, so rinse everything really well. Bring 3 quarts of water to near a boil. As it cools, add six bags of tea and dissolve a cup of sugar into the water. Let the tea steep for at least 15 minutes. Wait for it to cool to room temperature. Pour both the store-bought kombucha and the sweet tea you just made into the large glass jar or jug. Cover it up with the cloth and secure the perimeter with a rubber band or something so no flies can crawl in. Let it sit for about a week. Try not to disturb it too much. If it’s cold it will take longer, up to two weeks. You should notice a jelly-fish-like layer forming floating on top. It’s ready when it tastes right—which is something you’ll develop a taste for. It’ll taste gross for a while and then one day it’ll taste vaguely like apply juice and you’ll know. Pour all but a cup of the kombucha into your glass containers. This is the “second fermentation,” an anaerobic fermentation stage. This is where I like to cut up some ginger and toss it into the bottles with the kombucha. Experiment! Let the bottles sit out for a couple days sealed. Without access to air the fermentation changes and the kombucha will start to become effervescent (if it was not already).